Home / Retirement / 401k & Investing Tips / 5 Top Stock Trades for Thursday — Buy Salesforce’s New Highs? 5 Top Stock Trades for Thursday — Buy Salesforce’s New Highs? Despite President Trump hitting back at China — again — with more tariffs, the stock markets weren’t under as much pressure as investors would have thought. While the S&P 500 was down about 0.8%, the Nasdaq slipped just 43 basis points on the day. With the shakeup, we paid attention to what was hot, and what was not, for our top stock trades. Look at salesforce.com (NASDAQ:CRM) go. We don’t even need a trend-line on this type of name. For traders, this has been one of the best stocks. Yes it’s expensive and yes it seems destined to fall any day as it continues to run. But investors who have bought on continuous retests of the 50-day and 75-day moving averages, they have made a boatload of money. CRM could get caught up in a market-wide pullback, but like other cloud names, it’s not directly vulnerable to a trade war. As CRM breaks out to new highs, it should be on investors’ radar. While it could grind higher, perhaps to $150, buying right now is not a great risk/reward. CRM is an excellent dip-buying stock. We have preferred buying at the moving averages, but support could come into play near $135 too. Below $135 and short-term longs may want to lock in some profit and look to buy further down. Long-term bulls don’t have to worry though. 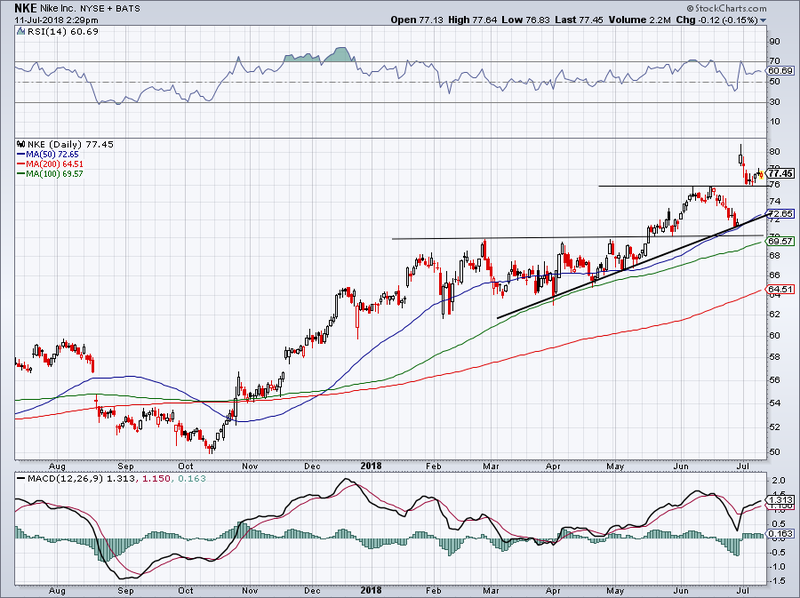 Short-term bulls in Nike Inc (NYSE:NKE) have a solid level to trade against at $76. 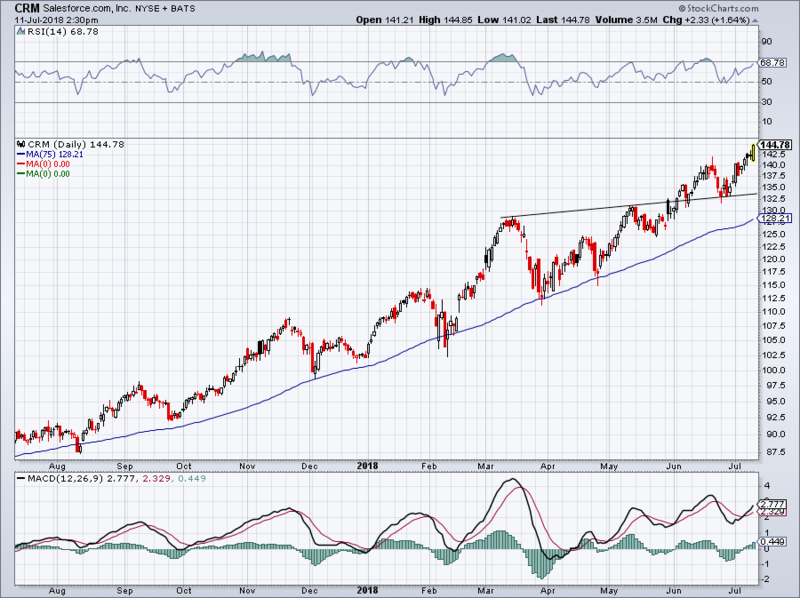 This level was previous resistance until Nike reported strong earnings results at the end of June. 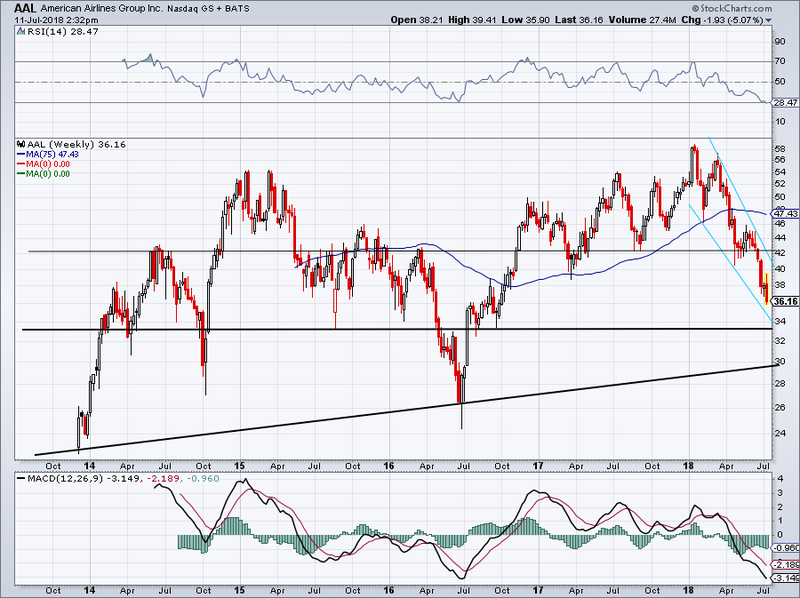 After a gap up to $80, shares pulled back and found this level as support. Even amid the market current market decline, NKE stock is holding up strong. A break below could trigger the stop-loss for some investors, while Nike would be a sure-fire buy in the $70 to $72 area. An excellent REIT candidate, Digital Realty (NYSE:DLR) is a stock that InvestorPlace readers have had ample warnings to buy. Now near $116.50 and with an RSI near 80, I wouldn’t be a new buyer of DLR today. With its solid yield and great business though, DLR has been in demand. Investors waiting to buy can wait for DLR to take a rest, while those that are long should be aware of potential resistance near $120. Should Digital Reality not take a rest before challenging this level, it’s likely it will remain as resistance. It would be healthy for DLR to take a rest, giving it the necessary energy to push through $120. Shares of Activision Blizzard, Inc. (NASDAQ:ATVI) initially fell Wednesday, despite announcing a live eSports agreement with Walt Disney Co (NYSE:DIS). Both stocks are advancing Wednesday. ATVI stock is now looking for new highs. Should it push through $79, it will find them. Support down near $74 held up, as did its recent trend-line of support. 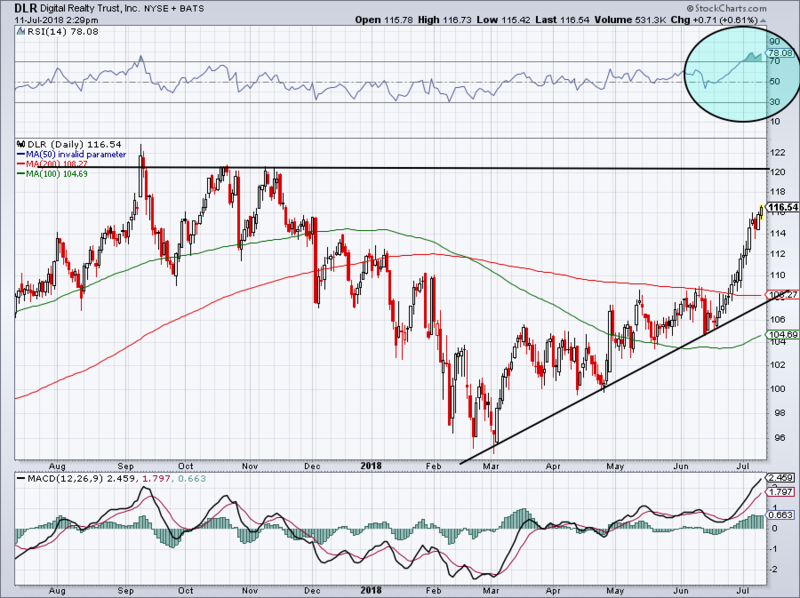 The stock’s series of higher lows bodes well for its move. Even if ATVI stock fails now, it will likely be retesting this level sooner rather than later. Its momentum-measuring MACD and RSI (blue circles) also bode well for bulls. One stock that doesn’t bode well for the bulls though? 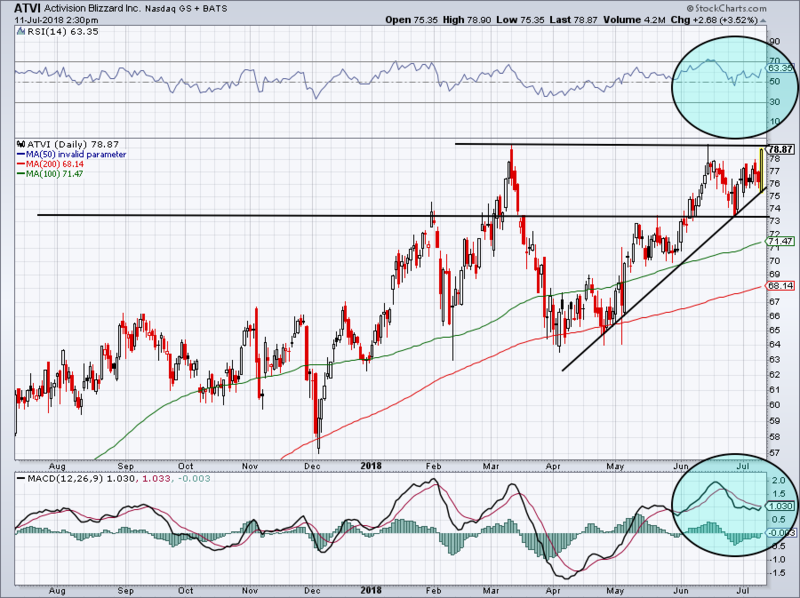 American Airlines Group Inc (NASDAQ:AAL). Shares are down 7.5% Wednesday after providing its second-quarter update. Worth noting is that Southwest Airlines Co (NYSE:LUV) initially fell on the day, but held right where it needed to. We covered LUV earlier this week. Regarding AAL, the stock’s fall is bad news, as 2018’s turbulent patch has led the stock to new 52-week lows on Wednesday. Trapped in a brutal descending channel, there’s no reason to buy quite yet. Near $34 could provide a bounce, and should shares really fall hard, they could make their way down to $30. I know AAL has a low valuation and pays a small dividend (yielding approximately 1%), but right now, at least from the technical side, American Air is downright ugly. I’d rather buy the dip in a winner like CRM than the one in AAL. Article printed from InvestorPlace Media, https://investorplace.com/2018/07/5-top-stock-trades-for-thursday-dlr-nke-crm-aal-atvi/.